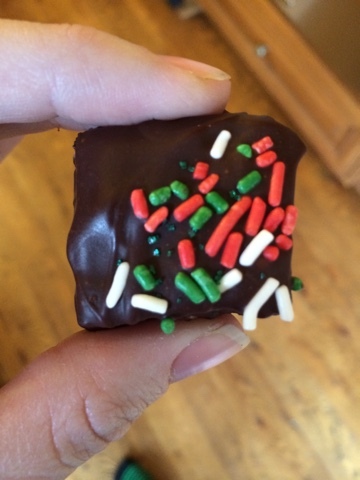 My first experience with Petit Fours was when I started dating my husband in high school and went to his house around Christmas to be offered one of these adorable little cakes from Swiss Colony, a Christmas tradition in his home. They were so yummy it was hard to not want to eat the whole box, especially with how much more crazy my sweet tooth was back then. 7-8 years later, our toddler daughter was there, in her Little but poofy Christmas dress, eating the little cakes with such delight. I didn't know if there was anything cuter than that petit little girl eating petit little cakes. But, by the the time she was 4 we had gone gluten free and sadly no more petit fours for us. Tradition was ruined! Petit Fours did remain a Christmas tradition for my husband however as his parents still send him a box every Christmas (he's not gluten free). Last year I was determined to make some, as my daughter fondly remembers from when she was 3 how good they were. 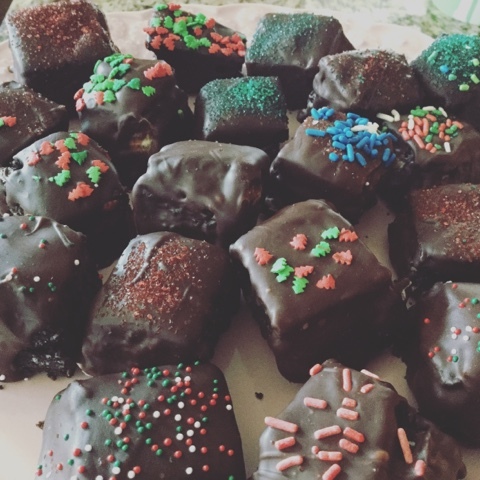 I researched how to make petit fours and then attempted to make gluten free petit fours. I made a gluten free chocolate cake and dairy free coconut cream for the filling and dairy free chocolate ganache for the coating. 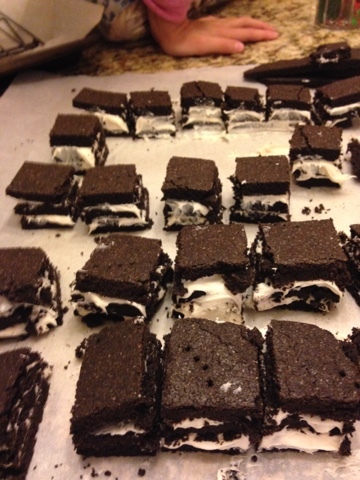 It was a lot of work, it was a big mess and they were as big as a hostess cupcake and tasted more like a hostess cupcake, so while it was not a complete fail as we still ate them, they were a total mess and not presentable...they were not petit fours. Separate chocolate dough into 2 balls. Place one half on cookie sheet lined with parchment paper, top with another piece of parchment paper and roll out into a rectangularish shape just a little over a 1/4 inch thick. Remove top parchment paper and if you like, trim the edges to make them straight and add the extra dough to the other ball of dough. Repeat with the other half on another baking sheet. Bake in preheated oven according the the sandwich cookie instructions, or until until it lightly springs back. (I ended up doubling the baking time since it was a larger mass since i wasn't cutting out cookie circles *about 14 minutes for me). Using a knife, spread some cream cheese frosting over one long strip of your chocolate cake. 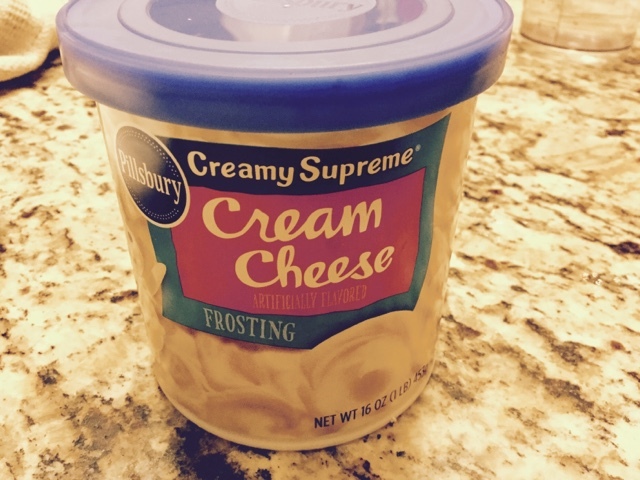 Carefully pick up another strip of cake and lay in on top and then spread that layer with cream cheese frosting and then add one more strip on top of the cream cheese. You now have 3 layers of cake with 2 layers of filling. 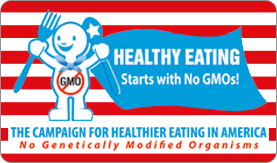 Repeat with remaining strips until you can't make any more. If you have excess scraps of cake, just leave those out in a dish for munching. 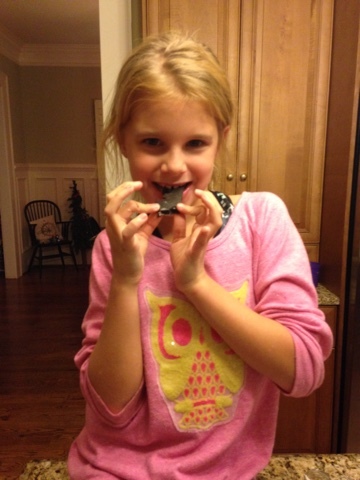 My fun little helper...she's very involved as she plans to open her own gluten free bakery. 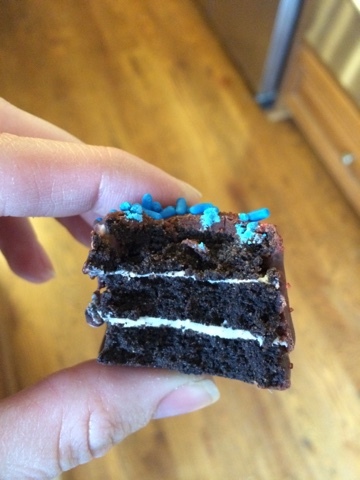 Now that you have some long layered strips of cake and frosting, take a sharp knife and carefully cut them into 1 inch sections creating 1 inch squares. Line a baking sheet with foil or parchment paper, place a cookie rack over top and then arrange your gluten free petit fours on the cookie rack. In a double boiler* add a bag of dairy free chocolate chips and 1/4 cup of dairy free milk. Stir until melted. You want the chocolate icing to be somewhat running so it's easy to spread over your cakes so if it doesn't drizzle off your spoon, add some more milk until you get the right consistency. Using a spoon or small spatula, carefully spread the chocolate icing over the top of your petit fours, letting it drip down the side. 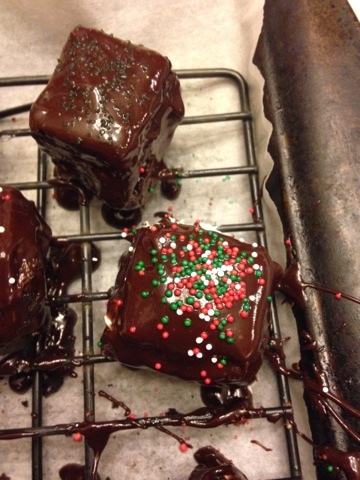 As it drips down the sides, using a spoon or spatula, carefully spread the chocolate icing over the sides, adding more frosting as needed and letting the excess drip down onto the baking sheet below the petit fours. They won't all be perfect but as long as you get the tops covered well and most of the sides, that's good enough. 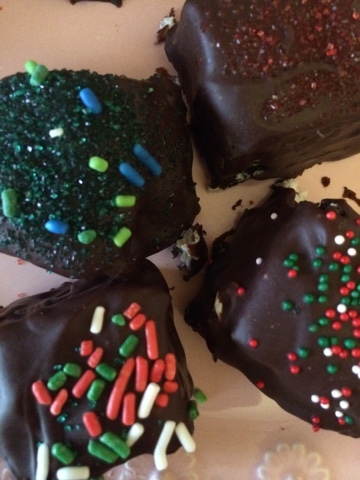 Then top with some sprinkles for added color and decoration and allow chocolate icing to set and then enjoy your easy gluten free dairy free petit fours! These were much less labor intensive than making sugar cookies!!!! 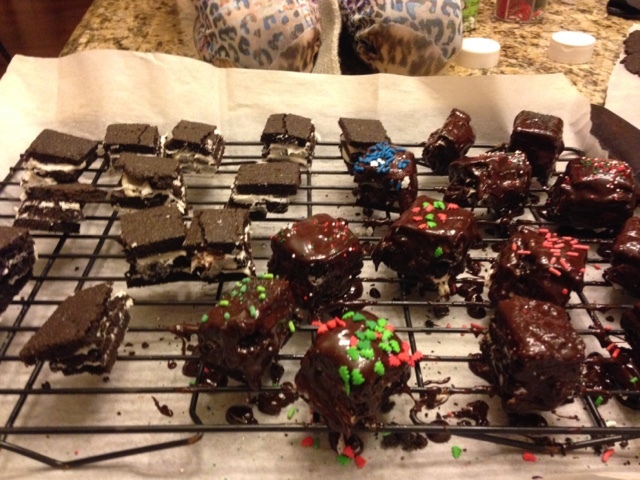 As you can see here, this was more of a challenge to make gluten free dairy free petit fours as easy as possible, and have some fun mommy daughter time, not looking for perfection. We had some that we thought looked perfect although most were not, but they all taste the same and they taste VERY yummy! *to make a double boiler, add an inch or two of water to a small pot, then place a glass Pyrex bowl over top of the pot and boil the water. Place the chocolate and milk in the glass bowl and store as it melts, this produces a smooth ganache. *usually I like to make everything from scratch, even if it's not "healthy" it's still healthier than using anything from a package with the extra preservatives and ingredients however, as this was an experiment and I wanted it to be as easy as possible, especially if they didn't turn out, I thought a shortcut now and then ain't the worst thing in the world...besides, stress can kill you too! lol!